Forts are easy. Grab blankets and something to throw them over. Clean up is pretty simple, too- fold the blankets, put them away. When I was a kid, my brothers would write "fort mail" and deliver it to my fort mailbox. I loved it! They were quite a bit older than I was, so they were being kind to me, but it meant so much to my little self. That's easy to do, too, and preschoolers love fort mail, snacks delvered to their "door", and visits from mom. Christian threw blankets over the couch and the ottoman. He was a little unhappy here because his blankets wouldn't stay put, so he learned some engineering lessons in the process. 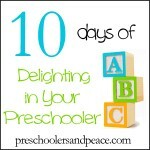 Day One of Ten Days of Delighting in Your Preschoolerstarts here. The 10 Days Series is organized by iHomeschool Network, a collaboration of outstanding homeschool bloggers who connect with each other and with family-friendly companies in mutually beneficial projects. Visit us on Facebook, Pinterest, and Twitter. And of course, click the image below to visit all the 10 Days posts from these homeschool moms of the iHomeschool Network. You'll be blessed with tips on how to handle bad days, cultivating curiosity, teaching with Legos, and much much more!